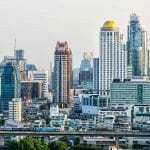 Thailand’s capital of Bangkok has become an extremely popular destination for travelers of all budgets. 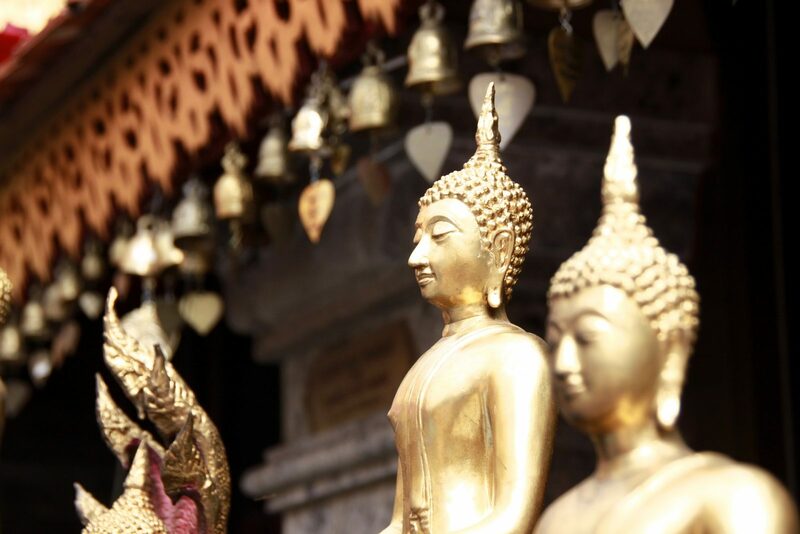 Drawn by the allure of amazing food, thrumming night life, and more temples than anyone can count Bangkok is literally banging! 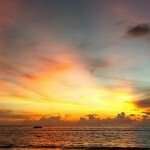 We have put together this list based on what we personally expect out of a great hostel in Bangkok, Thailand. Clean rooms, comfortable dorm beds with power outlets, secure luggage storage, friendly atmosphere that encourages interaction (but doesn’t force it), and a communal kitchen are all super important aspects of a Bangkok hostel in our eyes, and we prioritize them when suggesting a place to stay. 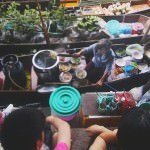 These factors all contribute towards a great hostel, and all can be found in the best hostels in Bangkok. 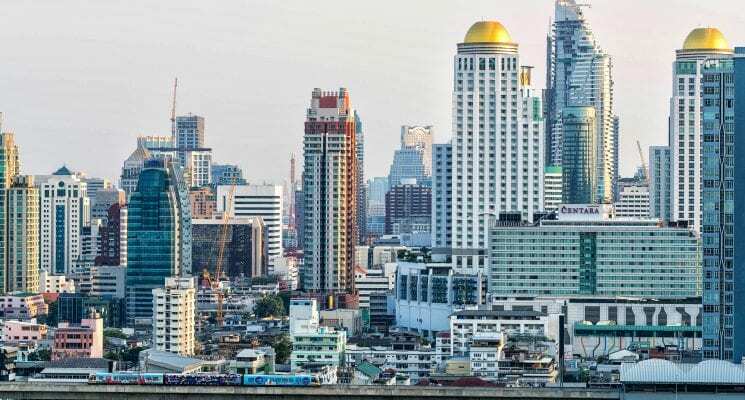 Don’t get lost among the thousands of options, check out the list below and get to know a few of the very best hostels in Bangkok! The name of the Yard hostel comes with double meaning. The backyard, where people can lie in hammocks, drink beer and chat, is what makes it one of the best hostels in Bangkok. Besides that, “yard” means relative in Thai and that is exactly how you will be made to feel by the hostel staff. The Yard hostel is located in the pleasant hipster area Ari, away from the crowds but easily accessible from everywhere by sky train. Which is pretty great, as getting around Bangkok can be a gridlocked nightmare. The staff at this Bangkok hostel are are usually top notch. They even drew a map on the wall to give you the best recommendations about the city. So don’t forget to take a picture before you go out! A free, if modest, breakfast is also a nice plus. If you are looking for a chill Bangkok hostel check the Yard out! For a party hostel in Bangkok, have a look at Here or Mad Monkey hostels listed below. Click here for more information, independent reviews, or current prices for the Yard hostel. One of the best party hostels in Bangkok is Here! Just 5-10 minutes walk from the Khao San Road party area, this is one of the best hostels in Bangkok for everybody who wants to socialize a lot. And drink. And continue drinking. But Here is not just a crazy party hostel, it also has nice relaxing areas. Privacy curtains on your bed also give you the option to decide whether you want your own space or to meet the other drunk backpackers in your dorm. An open-air communal area is great for chatting with the travelers from all around the world. The rooms in this Bangkok are equipped with lockers, power plugs and reading lights, and you get a towel and toiletries for free. 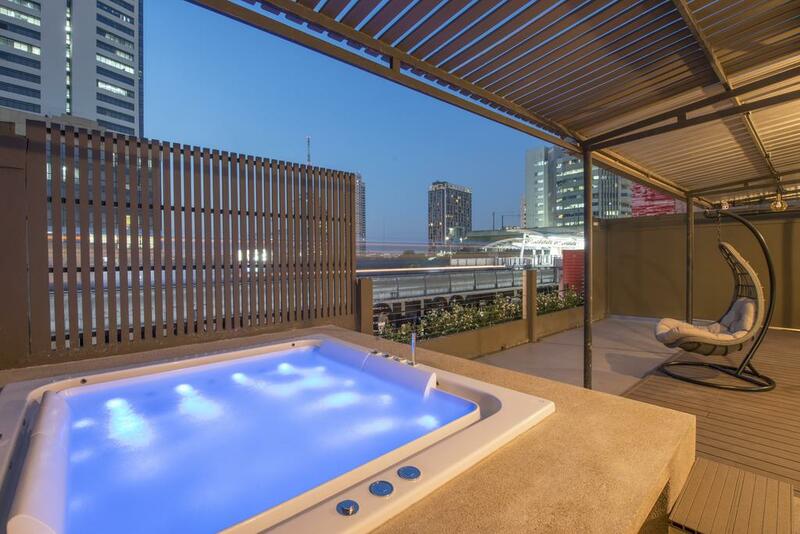 The waterfall showers are also a nice touch, helping you remove the sweat and grime of Bangkok off your skin after a long day of exploration. 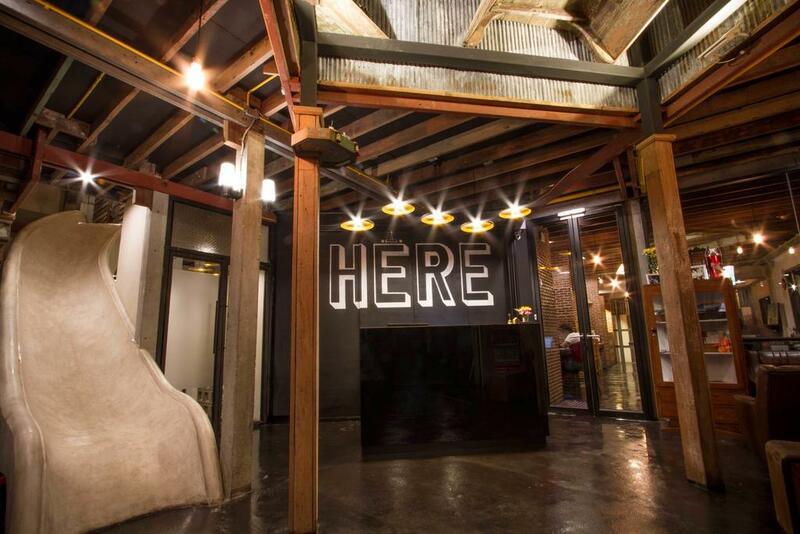 And now pay attention – you can SLIDE from your room to the lobby and chat with staff which is one of the quirky highlights of this Bangkok hostel. Delicious free breakfast is a sure thing and if you skip it, there is free coffee, tea and water during the day or the best Pad Thai place just few steps away! All of this add up to make Here one of the best hostels in Bangkok, and one of the best party hostels in Thailand. 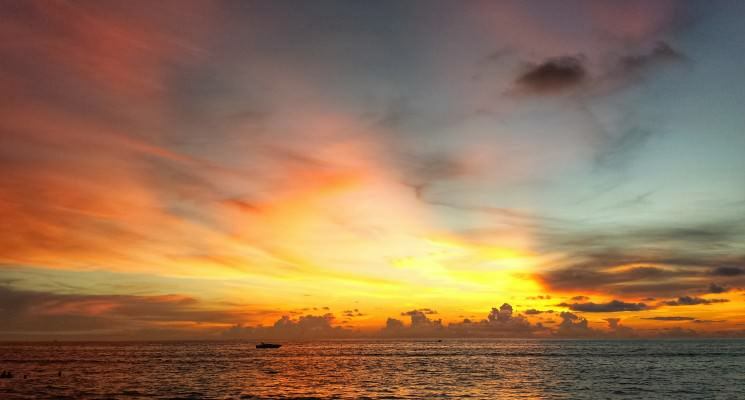 Click here for more information, independent reviews, or current prices for Here Hostel Bangkok. 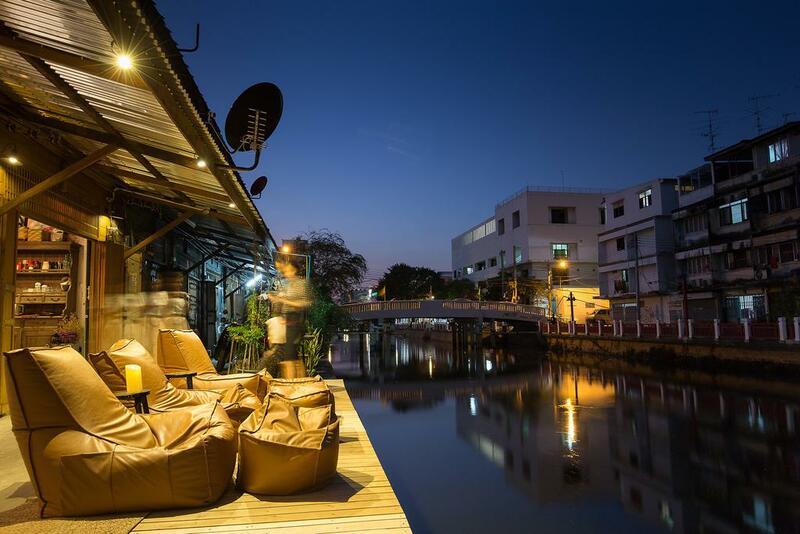 Ever imagined your stay in Bangkok sitting by a bay window and overlooking Banglumpoo canal? This fantasy can come true in Canale Hostel. The old house that this Bangkok hostel is situated in has a unique Thai decor which creates the special ambiance in the hostel. Furthermore it is located in an authentic local neighborhood, but only 5 minutes walk to Khao San Road, so called „Backpackers Paradise“. This Bangkok hostel is more like a family country house than a hostel, because the staff are super friendly, hospitable and professional. They take care of cleanliness very responsibly, they provide a good wifi, and good AC. Simply put, Canale is a hidden gem! Hidden because it can be tricky to find if you don’t prepare yourself in advance, and a gem because everything about it is great! Definitely one of the best hostels in Bangkok! 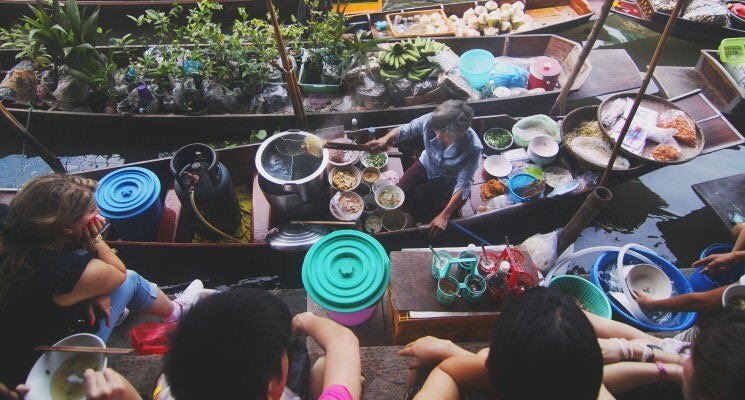 Click here for more information, independent reviews, or current prices for the Canale Hostel in Bangkok. If Here hostel doesn’t satisfy your party needs, Mad Monkey is still there for you! Its central location just 5 minutes walk from Khao San Road is just perfect for everybody who is not interested in being alone in the evening. Hostel staff Sofie, Bob and Izzy will make sure you have fun and meet like-minded travelers. 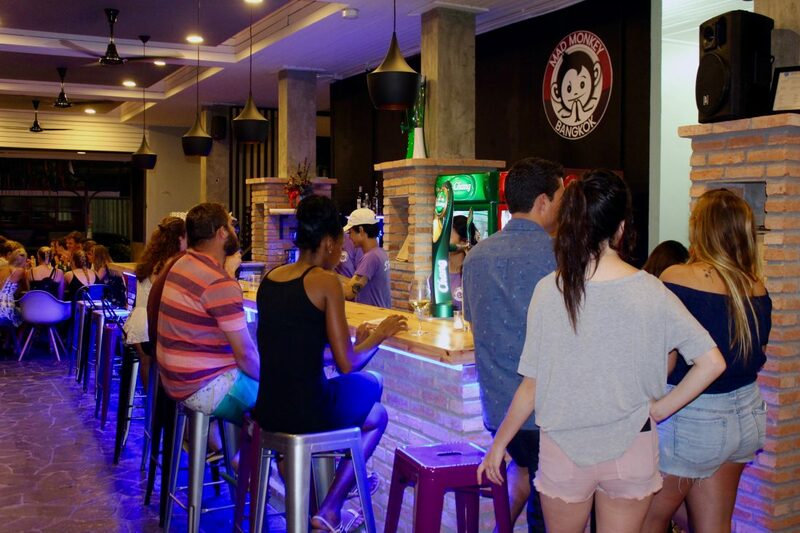 The large hostel bar and restaurant are the best place for first meeting, the nightlife nearby is another way to go. And if you get exhausted from the hot and chaotic city, the outdoor pool of this awesome Bangkok hostel will cool you down and help you recharge your energy. The choice of the rooms is usual, in Mad Monkey you can choose either a private room or 4 bed dorm. The rooms are clean, spacious and comfortable and provide huge lockers and outlets at each bed. Furthermore, the Bangkok hostel is socially responsible and supports community projects throughout Southeast Asia. 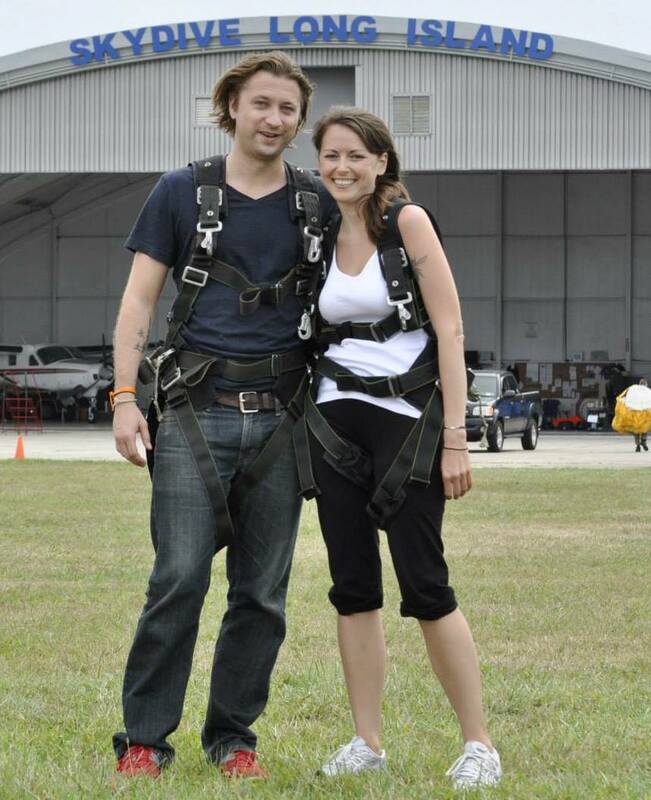 And you can also support them by staying at one of their hostels in Cambodia or Philippines. Mad Monkey is one of our favorite hostel chains in the world, and is without a doubt one of the best hostels in Bangkok. Click here for more information, independent reviews, or current prices for Mad Monkey Bangkok. Being located in Phayathai neighborhood in the center, The Posh Phayathai is one of the best hostels in Bangkok for backpackers and budget travelers travelers looking for higher standard accommodation. This spotlessly clean Bangkok hostel offers various types of rooms – from comfy dorms, through cabin rooms, to luxurious private rooms. All the rooms have a flat-screen TV, lockers and toiletries. The Deck bar on the top floor has something for everybody. Besides the drinks and snacks, you can jump into the jacuzzi, play pool, read books in different languages or join the regular events the hostel organizes. Delicious breakfast is included in price of this great Bangkok hostel, and all day long you can enjoy free coffee, soft drinks and snacks. The hostel can be reached by the Airport Rail Link via the Phaya Thai station from Suvarnabhumi airport. Click here for more information, independent reviews, or current prices for the The Posh Phayathai. This award-winning Bangkok hostel is situated very near the Grand Palace, Wat Pho and surrounded by number of temples and restaurants. It is only 10 minutes walk to Khao San Road, so you can chill here and party with other backpackers just a short walk away. Niras Bankoc Cultural Hostel is located in an old building with a very special atmosphere. Being a rather small hostel allows this Bangkok hostel to pay more attention to detail and take extra good care of their guests. That is what counts and makes it one of the best hostels in Bangkok, and probably in the rest of Thailand as well. Each room in Niras Bankoc is designed in a unique style – the best of which is probably a deluxe double sunroof room with the glass ceiling and a view of the sky. The dorms in this Bangkok hostel are equipped with extra large designer bunk beds, huge lockers with padlocks, reading lights and power plugs. Linens and toiletries are there for free. While this SHOULD be standard in any hostel these days, its not always the case. 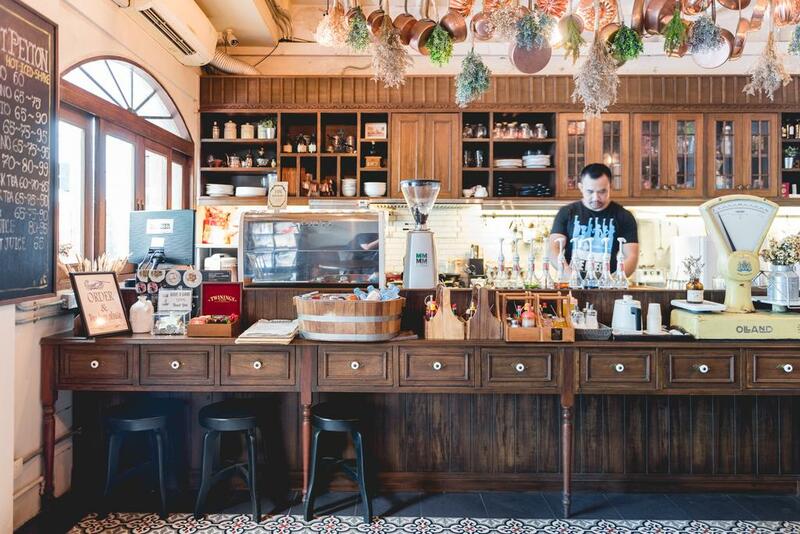 A chilled out café is just next door to this great Bangkok hostel and they serve premium quality coffee and incredible snacks (vegetarian option too). What more could you want!? Book this Bangkok hostel if you want a relaxed atmosphere! Click here for more information, independent reviews, or current prices for the Niras Bankoc Cultural Hostel. 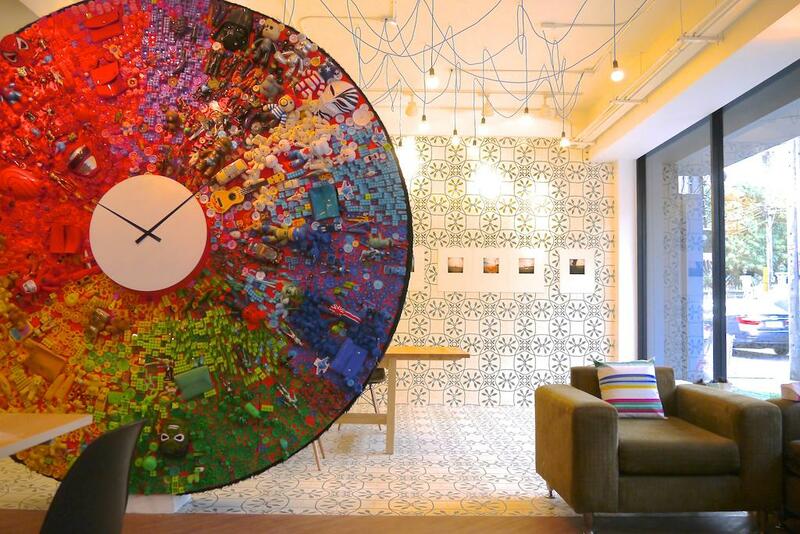 You can find this designer Bangkok hostel away from the crowds in Huai Khwand area, just next to the MRT station. This district is full of street food and the great Huai Khwang night market is near this superb Bangkok hostel. Yim Huai Khwang hostel’s staff want to make every backpacker smile (“yim” means smile in Thai) so there is everything you could need – backyard garden, rooftop, beautiful lobby with chilled atmosphere and much more. You can play games or an ukulele in the lobby, or exchange stuff you don’t need with the others in the donation box of this Bangkok hostel. Slogans on the walls remind you wanderlust feeling on every step. Every month, Yim organizes a special event with free food which is an excellent opportunity for socializing (and eating of course!). And if you have your travel buddy already and you plan to travel around, use their two months luggage storage – it’s for free! Free luggage storage for 2 months? 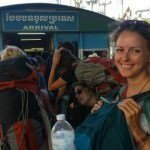 That’s a great perk that makes this one of the best hostels in Bangkok for backpackers who will be returning to Bangkok near the end of their travels. Click here for more information, independent reviews, or current prices for the Yim Huai Khwang Hostel. 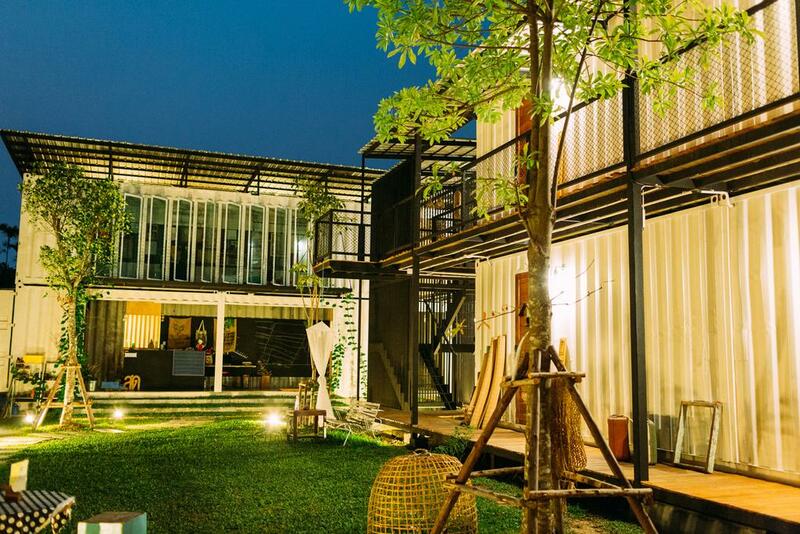 There you have it folks, our list of the best of the best Bangkok hostels. We hope we helped you pick the best Bangkok hostel for your needs! As always, happy travels, and we’ll see you on the road!